ALL.BIZ Peru Productos Peru Salud, belleza Artículos para salud y belleza Productos de salud Preparados de Ayurveda Energías que mejoran nuestras buenas. Energías que mejoran nuestras buenas. Peruvian Maca has been considered since ancient times as a food of excellent nutritional properties for humans and animals. Nutritional studies indicate maca containing : proteins , essential amino acids , carbohydrates, fiber , vitamins ( B1 , B2 , B6 .. ) , minerals such as iron , calcium , phosphorus, potassium sodium. 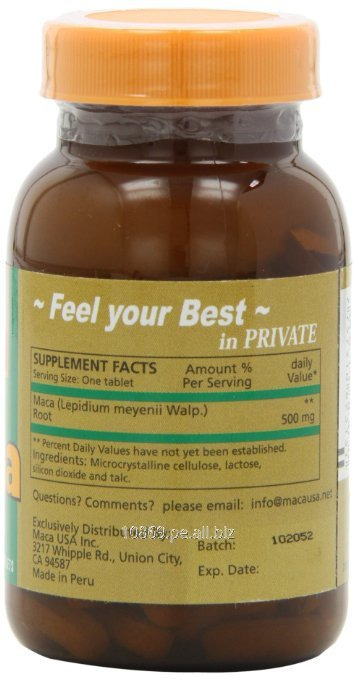 The nutritional benefits of this Andean root have been considered in medical studies , where it has demonstrated its nutritional action in anemias improvements growth (in animals ) , and energetic properties and anti - stress. Increases energy , fights physical / mental fatigue and stress. Highly nutritious , you can balance the daily diet with high and varied content of carbohydrates, amino acids, minerals , vitamins and fatty acids. Reduces the aging process , the unpleasant effects of menopause , prevents and cures osteoporosis and anemia. It stimulates the functioning of the endocrine system in men and women. It stimulates the hormonal balance . Increases fertility and sexual function.